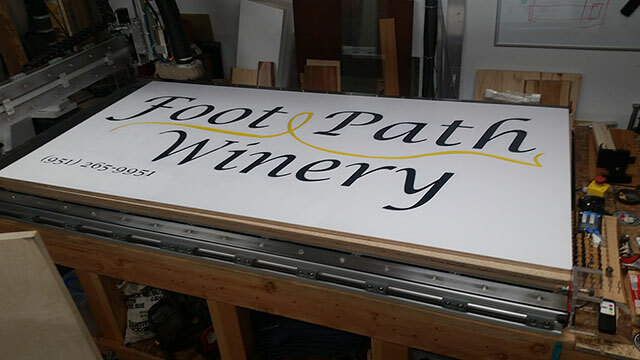 I was asked to do another winery sign, for Foot Path Winery, however this one in a short period of time. This one had an additional challenge which was to also incorporate a way to display the sign. I devised a simple method of dado cutting 4 x 4 posts which the sign would slot into. The result is a simple yet sturdy way to show off the Foot Path Winery name. Thankfully I learned a lot since the first winery sign I did so this next one was far easier and was machined in less than 1/4 of the time versus the first sign. Both sides were machined in the same day, then I moved onto the painting the next day. Two coats of paint were done per day to get to the final 5 coats of paint on each side.